Imagine the embarrassment of leaving your office lights turned on and returning to find a giant fiddler crab sitting on your desk. This fishy situation is happening in office buildings all across Charlotte, North Carolina –the crabs are plastic, and the fiddler variety is used for their notorious attraction to light. It is all part of a fun, social experiment happening in uptown Charlotte office buildings to remind employees to shut of their lights when leaving the office and power down their computers when headed home. If employees leave their lights on, coworkers will place crabs in the offending employee’s office to remind them to turn off their lights. In order to rid themselves of the burdensome crab, that employee must covertly “tag” another absent minded coworker by leaving a crab on their desk – all in the name of energy efficiency. And the amazing thing is that the playful reminder works! After “Crab, You’re It!” was introduced in one of Mecklenburg County’s office buildings, 26% more lights were turned off when not in use, leading to significant energy savings. 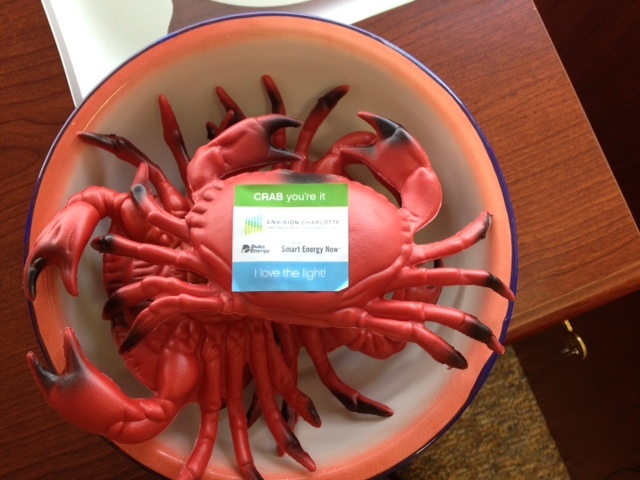 The “Crab, You’re It!” game – now adopted as part of the Envision Charlotte project – is just one of several innovative employee behavior change experiments that are leading to real energy reductions in office buildings in this entrepreneurial North Carolina city. 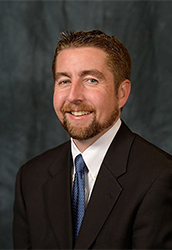 The creators of the game – the County of Mecklenburg staff – knew that most office employees are not motivated to save energy solely out of the goodness of their heart. We are all busy and saving energy in the office is not always top of mind. The key was to find a way for employees to actually get excited and have fun while saving energy. And, let’s be honest. Nobody wants to be crabbed. This entry was posted in Grid Modernization, North Carolina and tagged Envision Charlotte - 2012. Bookmark the permalink. Both comments and trackbacks are currently closed. Dear EDF: I love the idea of crab you are it but unfortunately the crabs in the picture are not fiddler crabs. Oh, well, maybe it doesn’t matter.